Just for your information, a total of ten crews incurred a 2 minute time penalty on the Border Counties which affected their final scores. A route amendment had been included (and signed for) in their pack when signing-on prior to the rally. This informed the crews that Stage 3 had been shortened which meant that the subsequent road section had been lengthened and that crews should mark their Time Cards accordingly. The organisers therefore had no choice but to stick to the rules as this was in a PR sensitive area, and the penalties stood. It’s a good job Steve Bannister has ‘friends’ otherwise we might find out nothing about the enigmatic legend that is ‘Banner the Malton Missile’. 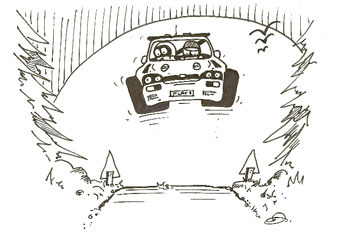 He finished 1st in Class, 1st 2WD and 11th overall on a snowy, slushy, slippery, wet and muddy Border Counties Rally, while all around him his rivals floundered and flailed. What’s so remarkable about that you might ask? He only became a great grandfather two weeks before the rally! Not just a grandad, but a GREAT grandad. When challenged about the veracity of this revelation he just shook his head and smiled and confirmed that he was now the great grandfather to a wonderful wee bairn called Darcy. And there’s more. It would appear that Steve has now joined the 21st century. He has learned to text. He has now realised that if he cannot get hold of folk he wants to speak to on his mobile phone (another masterful achievement in its own right) he can send them a text. That has now made him the bane of co-driver Callum Atkinson’s life: “Not only can he text,” said Callum, “but he can send pictures!” While explaining this Callum actually coloured his narrative with a few sweary words. It would appear that Steve could now give persistent PPI and double glazing call centres a few tips about sending messages and keeping in contact! Linzi Henderson appeared at the Border with a new left hand drive Fiesta R2 sourced from across the water and had her first run out in the car at the John Parker test day before the rally. She was a wee bit nervous at first, not because it had 200 bhp from its 1 litre turbo engine or that it was left hand drive, but just because it was new. After a few runs she was really quite chuffed with the car and the LHD didn’t faze her one bit. Her first cars were RHD Peugeots and MGs and she also drove her Dad’s LHD Subaru but as Walter explained: “She learned to drive sitting in the middle, so she can switch to Left or Right hand drive without thinking about it,” and when asked what do you mean ‘middle’?, Walter added: “She learned to drive on a tractor.” Of course she did, and that makes perfect sense, doesn’t it? Nikki Addison and Rachel Matheson were still smiling after their first ever roll although Rachel did cut her hand during the incident. In a mesmerising display of car control, when the sliding rear end of their Peugeot 106 caught the snow on the first stage, Nikki shouted to Rachel: “I’ve got this” – just before the car clipped a stone, tipped over and fell on to its roof. When it was recovered later, Nikki drove it out of the stage. Speaking of injuries, Bellaghy day-tripper Paul McErlean wa sporting some fairly recent looking scars on his left arm. Legacy of a rallying accident? Nope. Something entirely more dangerous. He broke his arm mountain biking in Austria last July on a steep downhill section when the pedal powered machine got away from him. And to think he’s got a competition driving licence! Mathew Calderwood was spotted clutching burgers and coffees at the Service Area and declared that he still has his Mitsubishi Lancer Evo6. He also declared that he will contest the RSAC Scottish Rally and his ‘home’ event Argyll Rally in Dunoon. He actually sounded quite sincere about his intentions. We’ll see, eh? The double act otherwise known as Milne and Lee were in fine form ahead of the rally start. Ian’s contribution was: “I thought white stuff was what they put on birthday cakes,” (and he’s certainly seen a few of those) while Ernie declared that his biggest decision of the day was what colour of underpants to wear. And the rest of us take our rallying seriously?! Tweak of the week? Donald Peacock’s Peugeot was spotted with wads of blue handwipe paper roll stuffed into the dash vents on the co-driver’s side to try and direct more hot air out of the driver’s side vents to keep the driver’s view clear of condensation. Demonstrating his spontaneous, quick and decisive nature, one Ernest Lee Esq proposed to Trish Milligan at the end of the Grizedale Stages last December. Trish has accompanied Ernie to many of the rallies he attends but that was the first time she had co-driven. Whether this was an initiative or compatability test we don’t know, but at the end of the rally where she successfully navigated him to 39th o/a and 2nd in class in the BMW the big chap proposed. Apart from the surprise that she accepted was the bigger surprise that it had only taken Ernie 30 years to summon up the resolve to do it! Gaun yersels you twa, belated congratulations to you both.